The Iowa Department of Transportation (DOT) is responsible for approximately 4,100 bridges and structures that are a part of the state’s primary highway system, which includes the Interstate, US, and Iowa highway routes. 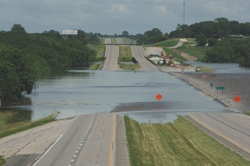 A pilot study was conducted for six bridges in two Iowa river basins—the Cedar River Basin and the South Skunk River Basin—to develop a methodology to evaluate their vulnerability to climate change and extreme weather. The six bridges had been either closed or severely stressed by record streamflow within the past seven years. An innovative methodology was developed to generate streamflow scenarios given climate change projections. The methodology selected appropriate rainfall projection data to feed into a streamflow model that generated continuous peak annual streamflow series for 1960 through 2100, which were used as input to PeakFQ to estimate return intervals for floods. The methodology evaluated the plausibility of rainfall projections and credibility of streamflow simulation while remaining consistent with U.S. Geological Survey (USGS) protocol for estimating the return interval for floods. The results were conveyed in an innovative graph that combined historical and scenario-based design metrics for use in bridge vulnerability analysis and engineering design. 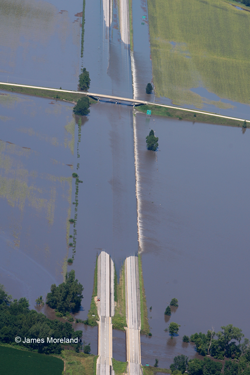 The pilot results determined the annual peak streamflow response to climate change will likely be basin-size dependent, four of the six pilot study bridges would be exposed to increased frequency of extreme streamflow and would have higher frequency of overtopping, the proposed design for replacing the Interstate 35 bridges over the South Skunk River south of Ames, Iowa is resilient to climate change, and some Iowa DOT bridge design policies could be reviewed to consider incorporating climate change information.